In this article by Shane Oliver, he suggests that given the low interest rate environment, returns are likely to also be low over the medium term (5 to 10 years). He provides some framework for estimating returns and suggests a projected 6.2% return per annum for a diversified growth mix of assets. This has fallen from 10.3% per annum at the low point of the GFC in March 2009, and 5 years ago the return was nearly 8%. 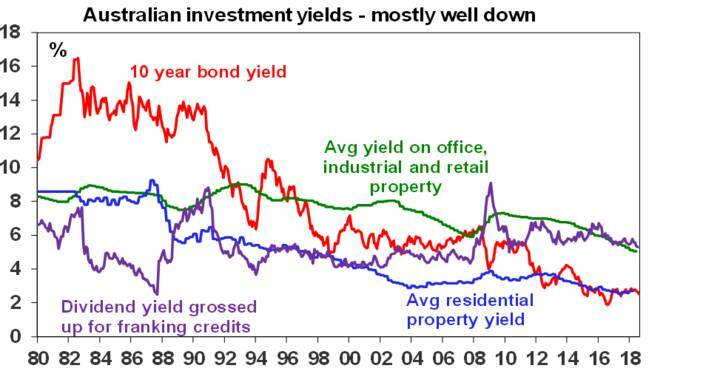 The chart below shows the decline in yield (or income flow) on a number of asset classes, including residential property. Shane also points out that these low returns reflect very low inflation and real returns haven’t fallen as much (the difference between returns and inflation). He suggests that focusing on assets with decent sustainable income flow help to provide confidence around future returns. We would appear to have been in a lower return environment for some time now and this is to be expected with low yields and constrained GDP growth. The shift to sustainable energy. Want to have a 30 minute conversation by phone with Adam specific to your current situation?